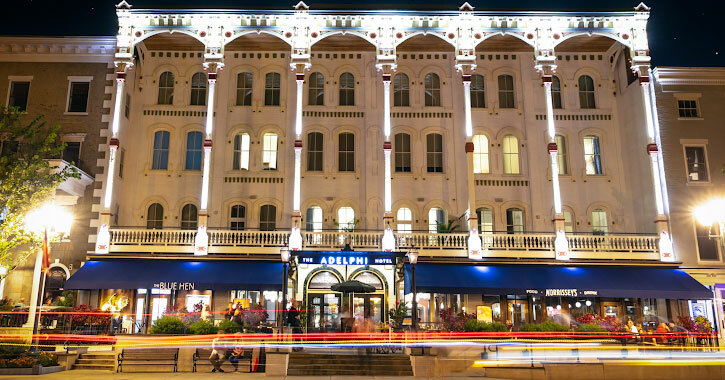 The historic and stately Adelphi Hotel sits proudly in a central location right on Broadway in Saratoga Springs. While its beautiful exterior and great location alone might be enough to entice you to stay, this luxury boutique hotel offers an experience that is ideal any month of the year. Restaurants are right on site, upscale amenities abound, and you are a complimentary ride away from multiple Saratoga hotspots. We sat down with General Manager Helen Watson to dive deeper into all the Adelphi offers, from the magnificent amenities to the superb on-site dining options. Find out the difference you'll experience when you stay at the Adelphi. 1) If you could only tell people one thing about the hotel, what would it be? The history. It was built in 1877 and is the only remaining Victorian era hotel left in the region. 2) Can you talk about the impressive amenities the Adelphi offers? Which amenity do you find guests most love, or which one are you most proud of? We have Mascioni bedding and towels from Italy. Red Flower bath products, a cashmere blanket, a homemade mini bar, and turndown snacks. Our bathrooms have heated floors, mirror, towel rack, and toilet seat. Outside of the room, guests can take advantage of a complimentary shuttle that travels to destinations within a five-mile radius along with our beautiful gold Adelphi bicycles if guests would prefer this mode of transportation. The most talked about out of all of these are the heated toilet seats. It’s a big hit even in the summer. 3) Racing season likely brings in lots of guests, but what other reasons or occasions draw people to your hotel? We have guests staying at the hotel for a multitude of reasons. Some are visiting friends and or family. Some stay as it is a halfway point to their destination (for example, they might live in New Jersey and are visiting Montreal). Some are here for business. We have a lot of locals who like to do a staycation. We have wedding parties, birthday parties, anniversary celebrations. 4) Who stays here more: guests from out of town, or locals who want to enjoy a special experience and get away from it all without traveling far? We offer a Locals Rate to make it accessible to guests who live within a 50-mile radius. We get a good mixture of locals and out of town guests. 5) What are the advantages to staying at the Adelphi in the winter? Not having to go outside for great dining I imagine is one! Yes, staying at a full-service hotel means you don’t have to leave if you don’t want to. We are located in the heart of downtown Saratoga which makes downtown very accessible. There are many shops and restaurants that are within walking distance and local attractions that are a five-minute drive. If you like winter sports there is the Spa State Park for snowshoeing and cross-country skiing. 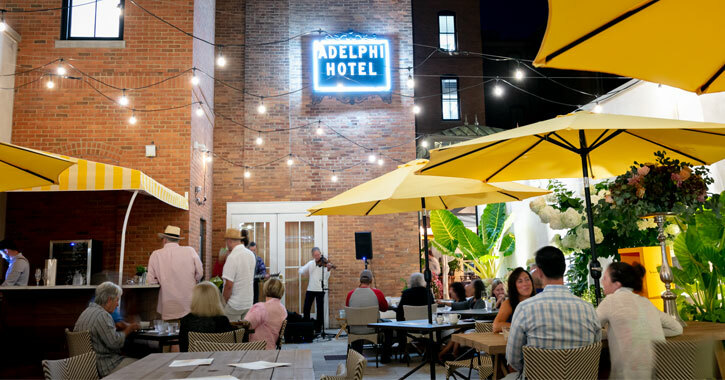 6) What can guests expect from the Adelphi Wine & Beer Garden? This is only open in the summer, correct? The Adelphi Wine & Beer Garden is only open in the summer. It is a beautiful sanctuary to enjoy sitting outdoors sipping on your favorite drink, snacking on sushi, and listening to live music. 7) How would you describe the difference between The Blue Hen and Morrissey's to someone wondering which one to visit first? The Blue Hen is a very stylish restaurant with a soft refined ambiance in a conservatory setting. It has a modern American menu using local, sustainable ingredients. Morrissey’s has an inviting masculine feel with dark wood and brass, serving delicious pub fare. 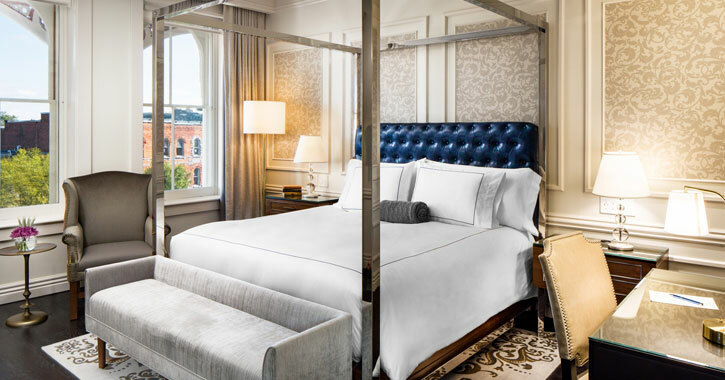 Whether you're visiting Saratoga or looking for a getaway close to home, the Adelphi is a top notch option year-round. Stay close to all Saratoga has to offer, or simply relax inside the boutique hotel, taking advantage of on-site amenities and fine dining. Regardless of the occasion or the time of year, you're guaranteed to have your expectations exceeded at the Adelphi.